Why not have a go at Gatefold Cards if you are wanting to try something a little more adventurous, and as your confidence grows you will want to make cards in other styles too. They are very easy to do and yet look so special. And of course the way you dress it up can make it look really lovely. Take a sheet of A4 card in your chosen color for your base. It will measure about 30 x 21 cms, and lay it flat on your work top. 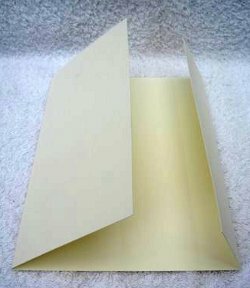 From one of the short sides measure in 10cms, then crease and fold it as described in cardblanks. From the other short side measure in 5cms and do the same. This will produce an "Off Centre Gatefold". And the picture shows you what it will look like. Creating your base from foiled or mirror card can give some spectacular results. Now comes the fun part of dressing it up to suit the occasion you are making it for. It would make a very pretty Wedding card too. Add lace and gemstones or pearls for a really luxurious look. 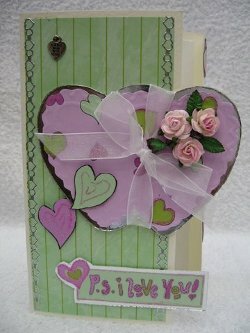 The large hearts are dry embossed from an embossing board and I have used silver mirror card. The heart paper is made slightly smaller. The pink flowers are from Wild Orchid Crafts and they have been sparkled with some glitter. The organza ribbon makes it into something special, and it would be welcomed by any lady as a token of love. And the flowers will last longer than the real thing !! Another way to create the card is by measuring the same distance from each side (7.5cms) then scoring and folding the side panels in. This will produce an Equal Gatefold. This card is given a completely different treatment, making it into a childs card, but is just as charming whichever way you decide to measure. 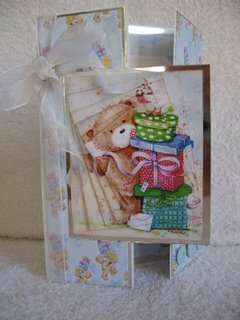 The image is of Popcorn the Bear and he is from Crafters Companion and there is a CD with matching backing papers to compliment the bear. It's up to you and your imagination as to what effects you can produce.